Town in the province of Posen, Prussia, with a population of 3,784, of whom 319 are Jews (1903). The Jewish community there is one of the oldest in the province. Jews are mentioned in the city charter of April 9, 1594. In 1634 the tailors' gild of Grätz permitted two Jews of Posen to settle in the city and to open a tailor-shop. The Chmielnicki rebellion brought disaster upon the Jews of Grätz. On May 14, 1663, the overlord of the city issued a "Jews' privilege," regulating the affairs of the Jews. During the "northern war" (1700-21) the community was almost entirely destroyed, and its rabbi, Judah Löb, who had been called in 1701, was obliged to flee to Frankfort-on-the-Oder. The great conflagration of 1711 was also a heavy affliction to the community, which had to apply for aid to coreligionists at Posen, who afforded relief to the best of their ability, although themselves impoverished and in debt through a succession of misfortunes. In 1797 it was decided that the officials of the community should consist of the following: one chief rabbi, one assistant rabbi (dayyan), three elders, one "schulklopfer," one synagogue attendant, two undertakers, three hospital nurses, two cantors, three school-teachers, and one bathhouse superintendent. The debts of the community in that year amounted to 10,151 thalers, repayable in yearly sums of 441 thalers. For that year, also, the rabbi received a salary of 88 thalers, while 666 thalers were paid to the overlord. In 1798 a Jew was permitted to live in the house of a Christian. At the end of the eighteenth century there were 1,135 Jews, nearly half of the whole number of inhabitants; the number had risen from 1,499 in 1816 to 1,634 in 1820, the largest in the history of the city; by 1840 and 1850 the number had decreased to 1,548 and 1,532 respectively. The Polish uprising of 1848, during which the Jews on the whole remained neutral or sided with the Germans, destroyed much property in the city. The following were rabbis in the seventeenth and eighteenth centuries: Simon b. Israel Ashkenazi (c. 1677); Benjamin Wolf b. Joseph Joske (c. 1689); Judah Löb b. Solomon, previously darshan at Prague, and subsequently rabbi at Schneidemühl (c. 1699); Phinehas Selig b. Moses (dayyan of the German community at Amsterdam in 1708); Sanvel Spira of Lemberg; Gershon b. Jehiel of Landsberg, who at Friedberg in 1742 called himself ex-rabbi of Grätz; Jacob b. Ẓebi Hirsch (1743); Marcus Baruch Auerbach. Among those of the nineteenth century were: Benjamin Schreiber (d. 1839); Elijah Guttmacher of Borek, formerly at Pleschen, the "Grätzer Rav," whose counsel and aid were sought by thousands from far and near (d. 1874); Dr. B. Friedmann, subsequently at Berlin (d. 1902); Dr. Silberberg, subsequently at Königsberg; and the present (1903) incumbent, Dr. J. Friedmann. 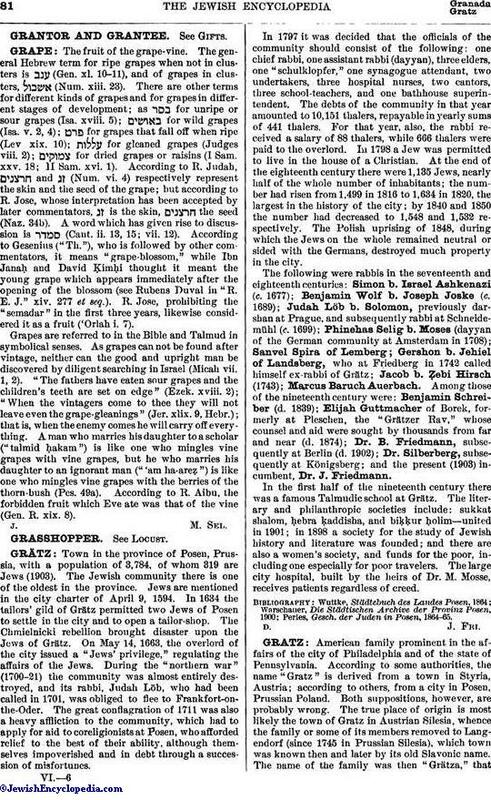 In the first half of the nineteenth century there was a famous Talmudic school at Grätz. The literary and philanthropic societies include: sukkat shalom, ḥebra ḳaddisha, and biḳḳur ḥolim—united in 1901; in 1898 a society for the study of Jewish history and literature was founded; and there are also a women's society, and funds for the poor, including one especially for poor travelers. The large city hospital, built by the heirs of Dr. M. Mosse, receives patients regardless of creed. Perles, Gesch. der Juden in Posen, 1864-65.